This article explains the details how you can receive a Thai Massage certificate and NCBTMB approved continuing education credits through our online training courses. What kind of Thai Massage certificate do we issue? We offer two kinds of certificates. The first one is the ‘International certificate’ which we issue to students anywhere in the world, provided they enroll in our certification program and go through the qualifying process. Students often want to know if this certificate is valid in some specific country for some specific purpose. However, there is no way for us to have accurate and up to date knowledge about all the massage laws and rules in all countries. In some countries you do not need any massage license, in another Thai Massage is treated differently from other kinds of massage, in another the rules change from state to state (like in the US), in another it is primarily an insurance issue, etc. You need to find out locally what rules apply to your situation. Thai Healing Massage Academy is a well-established institution which has been training students since 2001. It’s director, Shama Kern, is authorized by the NCBTMB as an official continuing education provider for massage therapy in the US. He is a member of well-known associations like ‘Thai Healing Alliance’ and ‘Old Medicine Hospital’ in Chiang Mai, Thailand. However it is up to the authorities or schools in your country to decide if they accept our certificate for a particular purpose. What is a CEU certificate? Our second certificate is the ‘CEU certificate’. Licensed massage therapists from the US already know what this is. But to our non-US students and readers this word might not mean anything. There are also aspiring therapists from the US who are not familiar with CEUs. Therefore let’s explain the concept briefly. The bottom line is that if you are not from the US, you can simply disregard the CEU certificate option. US therapists have to fulfill continuing education requirements in order to keep their massage license active. This is commonly referred to as CEUs or CE credits or CE hours. CE stands for “Continuing Education”. Therapists have to regularly study a certain number of CE hours in a program which is approved as continuing education material. Shama Kern, the director and principal instructor of Thai Healing Massage Academy, is approved by the National Certification Board for Therapeutic Massage & Bodywork (NCBTMB) as a Continuing Education Approved Provider (provider number 451985-12). Are there continuing education requirements for massage therapists in other countries? Yes, there are other countries which have continuing education programs. However massage laws can and do change. We cannot follow them for all countries. Therefore it is important for you to do research locally for correct and up to date information. If you find out that there is some kind of continuing education for massage therapists required in your country, you can inquire if our “International Certificate” will be accepted. Why would you want a massage certificate? What are the qualifications for our massage certificates? 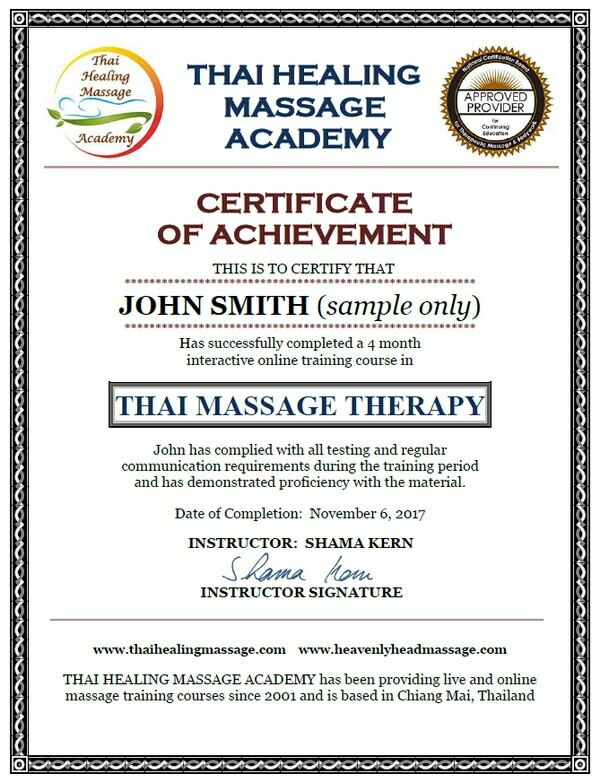 Thai Healing Massage Academy only issues massage certificates to students who have demonstrated that they have followed the course, practiced it and understood the concepts. How can the instructor see if you follow the program in an online course? Obviously we cannot physically see you practice. But there is a workaround. If you regularly post reports about your progress and your experience with the course in our forum, we accept this as evidence that you are following the course. You can read about the specific requirements for certification on this page. US students who enroll in the CEU program have to answer 5 questions per CE hour, as required by the NCBTMB. The exact qualification process for both types of certificates is described in the course manuals of our larger courses or on this page. Can US therapists get an International Certificate too? Why do we issue two kinds of certificates – why not just one? The CEU massage certificate is very important for US therapists since they need the continuing education hours. For non-US therapists this certificate is not useful since it is only issued for a particular purpose in the US. We issue an International Massage Certificate for our international students. This certificate is issued by Thai Healing Massage Academy only, whereas the CEU certificate is tied to the NCBTMB, the National Certification Board of the US. Are there time limits for completing the certification process? Yes, there are. They range between 6 months and 1 year depending on the length of the course. This time limit begins when you register for the certification program, not when you purchase the course. In other words, you can buy a training course, and two years later you can enroll in the certification program. From the date of registration you have a certain number of months to complete the certification. Should you enroll in our Thai Massage certification program? You might need the certificate for CEUs or other reasons. If you are enrolled in the certificate program, it keeps you on track since you have to follow the program on a regular basis. This counteracts the tendency to skip a lesson, delay the practice until later, or just procrastinate. The certificate program is a motivator and helps you to stay focused. Our main program and core training course, Complete Thai Massage, is a 4 month long training. To go through it is definitely an achievement. A certificate is a great reminder and an inspiration for you. Even if you do not need a certificate for a specific reason, it is still an excellent idea to go through the massage certification program for the above-mentioned reasons. Personally, I have a stack of certificates from many massage courses which I have attended. I never had to show them to anyone. But whenever I look at them, they are a wonderful reminder of a time of learning, inspiration, meeting interesting people, and personal and professional growth. Going through Thai Healing Massage Academy’s certification program will help you learn in a more focused way, and you will be the proud owner of a document which will always be a source of inspiration and good memories for you. If you want to see our courses with certification options, and how many CE hours you can get, you can find this information on this page. The author, Shama Kern, has been practicing and teaching Thai Massage for 18 years. 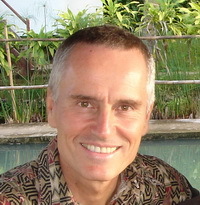 He is the founder and director of Thai Healing Massage Academy and creator of 20 Thai Massage online training courses. I am a LMT in Texas, I offer Thai.I have taken some classes but I want a certification in Thai. What classes do I need to take. Thank you! I would like to receive your cec’s as well as once I have tested I would also like to Register my website with you. Hi Don, I sent you an email with detailed info. Actually just by posting this comment, your website is automatically registered with my site. Thank you so much Shama. i beleive I will do the international Certification as I am fairly confident Yoga alliance will recognize it. I am happy with education no matter what. I feel that this kind of massage is such a good base for the all others as it touches on so many things it seems. Pressure, Reflexology, Stretching. I think its a great start to an already prospering business I have. i have practiced before but met an instructo in Maui with your credentials. I intend on completing modalities beyond your ” Complete Thai Massage” Also, i am having a hard time finding where the test questions are located. Could you send link? I am a yoga instructor that has been through training for Thai massage and have been seeing the wonderful healing affects it has on my clients for almost a year. I recently stumbled upon your website and I am so excited to get started. I just need to know which one I should take. I am not a LMT but if the CE’s would help in some way, I would like to have them. Please advise. I live in Texas. If you are not a licensed Therapist, you don’t need the CEUs, but you can enroll in the certification program for the International Certificate which would work fine for you. If you decide to come on board, I am looking forward to working with you. We have a lot of yoga teachers who have taken this course. Thai Massage and Yoga are a perfect combination. If you have any more questions, please feel free to contact me at any time. Thank you so much for your quick response! I am so excited to get started. Yes, Thai Massage and Yoga are a perfect combination. I also work for a chiropractor and get to use Thai Massage on some of the patients and it really helps their healing process. I am looking forward to learning new techniques and being a part of Thai Healing Massage Academy. And I am excited to have you as a new member. I always love to work with people who fit right in like you. Yoga, Thai Massage and Chiropractic are an excellent triangle. I have always found that Chiropractic work can be greatly enhanced and its effects can be prolonged by including Thai Massage in the treatment protocol. I have been practicing since 2003 and would really like to travel to Thailand for 90 days and practice with you. Could that be available? thank you. Hi Monica, please get in touch with me either via email (shama@thaihealingmassage.com) or via skype (shama108) and we can discuss this. If I take the complete course in parts will i still be on yhe certification program? Rose, please go to this page and scroll down to the “Thai Massage Component Course” section. There is a comparison chart which explains the differences between taking the course as a whole or in parts. I was wondering if you can acccept payments. It would just be easier for me! Thank you for your help! Brittany, I don’t have a payment system. However if you use a credit card, you could pay it off over a few months. Does this have CEU’s Credit. Sir can I enroll Between March or April this year about the full course of COMPLETE THAI MASSAGE. Hopefully that this course will help me to improve my knowledge in myself learning massage therapy. If this course have a certificate that I can use in my local country int the Philippines? Hi Angelo, you can enroll in the Complete Thai Massage course at any time, and yes, we do offer a certification program. I don’t know what the requirements are in the Philippines and what kind of certificates are accepted there. You can find that out locally where you live. I am a licensed massage therapist who practices Thai massage but I want to further my knowledge of Thai massage. I am due to renew my license and need the CUEs. I am concerned that the state of Pennsylvania will not recognize my certification and CEUs through an online course. Has this been a problem in the past with any other massage therapists, and if so, were the CEUs recognized by the state? Hi Jenna, our CE certificates only state that you earned the CEUs, they don’t mention if the training was live or online. I have issued lots of CEU certificates, and so far nobody has ever told me that it was not accepted. Online CEUs are not of lesser value. After all, I am an authorized provider by the National Certification Board for Therapeutic Massage and Bodywork (NCBTMB). Online training is an official category and is growing in popularity all the time. So even if the certificate would mention that the training was online, that should not make a difference. CEUs are different from learning massage from scratch. Only trained therapists need them. If you would try to use our certificate toward your required hours to become a licensed massage therapist, you might run into acceptance problems, however CEUs are a totally different category. They just certify that you took so many hours of continuing education. My courses and those of hundreds of other online training providers have been evaluated and approved by the NCBTMB, and the CEUs are valid. If you want to be sure, just call your state licensing board or check with any massage school and ask them if NCBTMB CEUs are valid in Pennsylvania. Which modules does your certification program include? I’m interested in possible purchasing all your courses. I am already in an RTT program and don’t need to be certified. I’m interested in learning more techniques. I currently need the knee course. Any suggestions? I sent you an email with more specifics regarding your question. Hello ! This course sounds exactly like what I am wanting to add to my holistic practitioner and yoga instructor training. I have inputted my email for the free download and then will order the complete course when I get home from work. I do have a question however. Do you have this course available for the iPad ? Once the course modules are downloaded, you can play them on any device including an iPad. I know for a fact that there are students who use an iPad for this course. I am from Canada, and with the Natural Health Practitioners of Canada (insurance program) we are required to do continued education in order to keep our NHPC status. So do you give certificates upon finishing a course?? And how does one obtain the certificate?? Thank you. Looking for a reply to show you are really out there. I recently attained my Associates Degree in Therapeutic Massage and truly want to learn Thai massage; is it possible to purchase the handbook(manual)before taking courses? I love your introductory videos. Not only that, but there is nobody else out there who makes himself (or herself) as available for an online study program as I do. That’s what makes Thai Healing Massage Academy unique. It is not just a product which you purchase, and then you are on your own. You have an actual interactive and fully supported training system here. I don’t sell the course manual by itself since it would not be of any use without the course. However you can invest in the program and check it out for 30 days totally risk free. That’s much better than looking at the course manual. With your Associates degree in therapeutic massage you have plenty enough background to learn Thai Massage effectively through this online training program. And if you ever get stuck with anything – I am definitely “out there” to help you with any and all questions for as long as you need it, as I have done with hundreds of students over the years. Thank you so much for the prompt response Shama. It is a blessing to have you there for us who have interest in learning the healing techniques of Thai massage; more than just the mechanics. I will complete my Associates degree in Therapeutic Massage soon and desire to focus on Thai massage to go along practicing yoga. I am pleased and will be needing your instruction soon. Blessings! Actually Thai Massage and yoga are a great combination. Way over half of the students of our various courses either practice or teach yoga. The two systems fit like hand in glove which is not too surprising considering that Thai Massage has its origin in India’s yoga system. I am so excited to have a new live course, at 65years of age I have no thought of ever “retiring” ; seems when most do they retire from life. This new goal adds much life and vitality. Retirement is an overrated concept. I will be 60 in a few months and the thought of retiring has never crossed my mind. Massage is a great way of adding meaning to our lives, keep us active and contribute to the well being of humanity. Why would anyone want to retire from such an activity as long as we are in good enough shape to do it? Actually Thai Massage can help us stay in good shape! I am interested to know about thai massage because I wanted to become a thai massage trainer in future. I am working in the spa before and have an idea/basic knowledge about yoga,thai and aroma therapy massage but i am not doing the actual massage as a part of my work only knowing all the benefits and watching therapist during training then I always performed to my friends and family and I am happy when I do massage to them because they liked it. What interest me most is the thai massage and I want to become a certified trainer someday.I really want to know and study online your complete thai massage course. Please advise if it is fine. Hi Ruth, certainly it would be fine. The Complete Thai Massage course will definitely teach you all you need to know to become an excellent Thai Massage therapist. Hello. I am a natural healer, reiki master and holistic practitioner. I live in the us but am looking to take the international Thai massage certification. I want to expand my practice and be able to offer my clients a variety of healing modalities. How exactly do I begin the course to earn the international certification? I signed up to receive the 6 videos in email, but this is not the course, correct? Please inform me on how to get started. Thank you! Hi Katrina, I sent you an email with a detailed response. Hello again Shama. We have exchanged messages a few times. I live in Indiana at this moment. I will soon take up your study during the summer session at school. I will have my Therapeutic Degree in July. Also I we have share my intention of coming to you in Chang Mai in November of this year. I will be coming with my fiancé and can stay as long as my spirit directs me. In loving kindness thank you! Denise, you can take the CEU exam 3 times at no additional charge. So far it has never happened that someone failed the test 3 times. The answers are all in the videos, and the only way to fail the test is to not watch the course videos. Hi Shama, I am a LMT and have been in practice since 2004. I primarily worked on children with disabilities but also did massage for a adults as well. I am an RN and have several degrees in health. I am also a nutrition consultant and holistic practitioner. I am interested in doing thai massage. The question I have is whether a certification is required to do thai massage. I have contacted some yoga studios but I am not sure whether they require the certification. I have checked out other online coursed in Thai. Thank you. Hi Denise, if you are a LMT already, you don’t need any additional licence to practice Thai Massage professionally. Certificates (if you are in the US) would be mostly required if either you need CEUs to keep up your massage licence, or if you work in a place where they want to see some evidence that you have studied Thai Massage. Bottom line is that you don’t need certification to do Thai Massage if you have a massage licence already. This goes for the US. If you are from another country, different rules may apply, however. You get hands-on time by practicing the material with your practice partner or on actual clients. It is not so different from a live class where you watch the instructor demonstrate, and then you practice with other students. In our case you watch the techniques from the video, and then you practice. The advantage of the online method is that you can watch the videos as often as you like, whereas you cannot re-watch a live class. Obviously you need someone to practice on, but that doesn’t seem to be difficult for our students. They work on colleagues, friends, family members, other volunteers, actual clients, or yoga students in case of yoga teachers (which many of our students are).